As we are in the midst of wedding planning season for this year, it’s time to consider what floral trends you what to incorporate! There are always a variety of floral designs that it might be hard to choose with so many options. 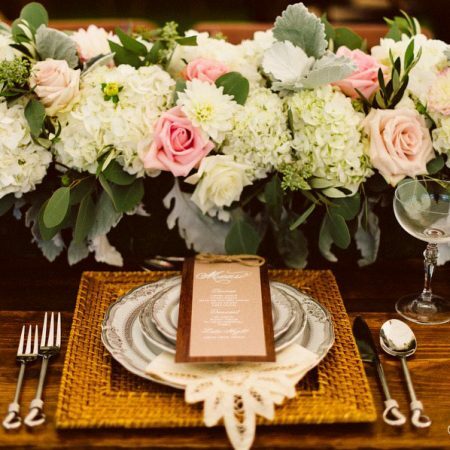 Here are just a few floral wedding trends that will be very popular this year to help you with your decision! You can integrate any of these stylish trends into any part of your wedding like down aisle, on the reception tables, with backdrops or even on the cake! 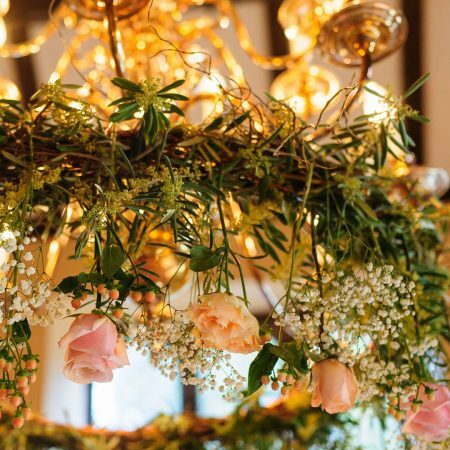 It’s important to work closely with your floral designer if you wish to use these floral trends in your upcoming wedding. If you’re in need of more inspiration, check out our Pinterest page! You’re engaged, now where to begin!? 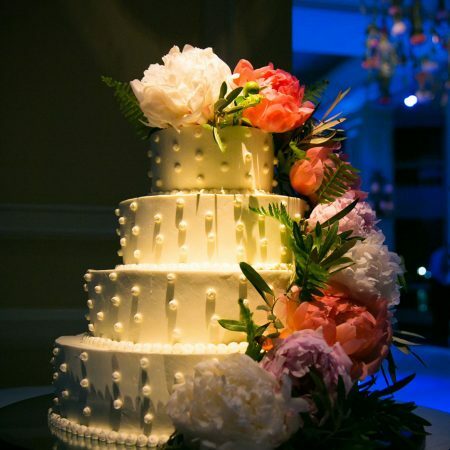 In the process of planning your wedding and meeting with your floral designer, you should be well prepared. 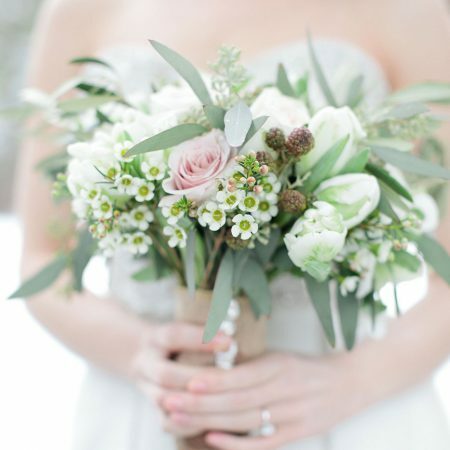 It’s important to have an idea of what type of flowers you want to incorporate into your wedding. 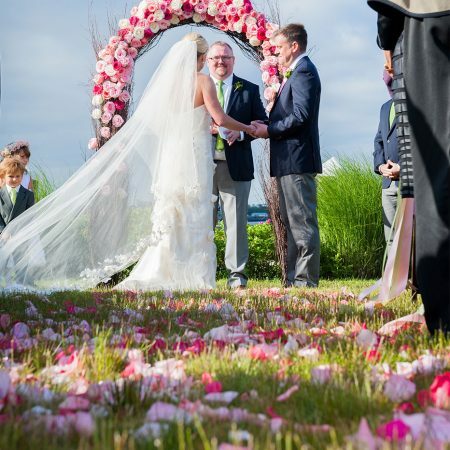 Places where flowers are included for the wedding include the bridal party and family, as well as in the ceremony and reception. 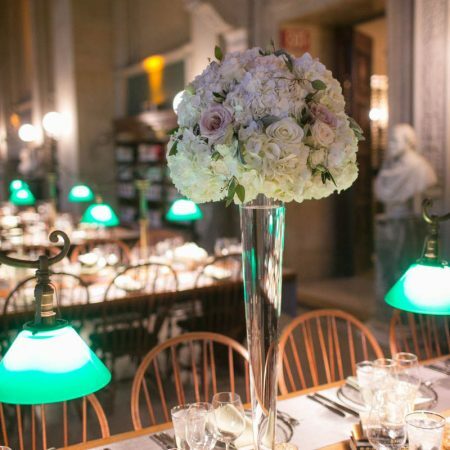 When meeting with your floral designer, you should come in with a price line so that your designer can guide and help you stay within your wedding budget. 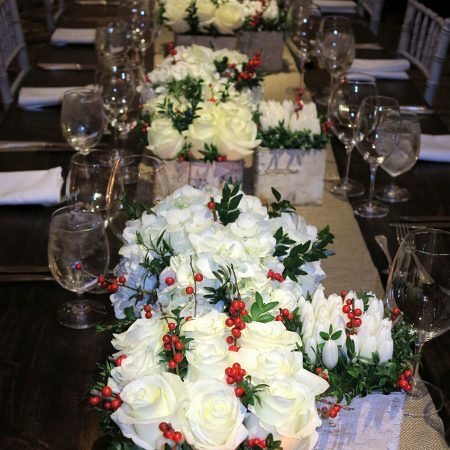 Your designer can help you choose the perfect floral arrangements so your venue, gown, and wedding party are all consistent. 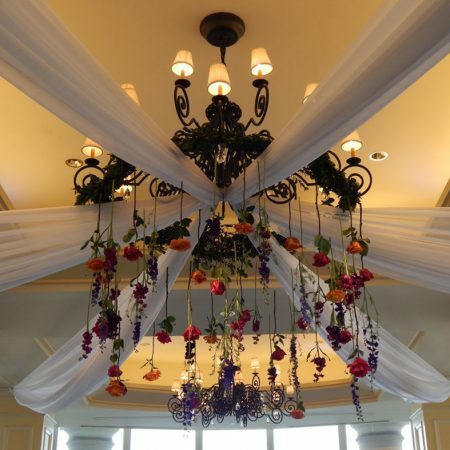 Knowing your color scheme can be very useful when in your consultation because your floral designer will be aware of what flowers would work best and what flowers may not be seasonal on the day of your wedding. It may also be helpful to provide examples of floral arrangements, include as many images as possible that convey your vision. 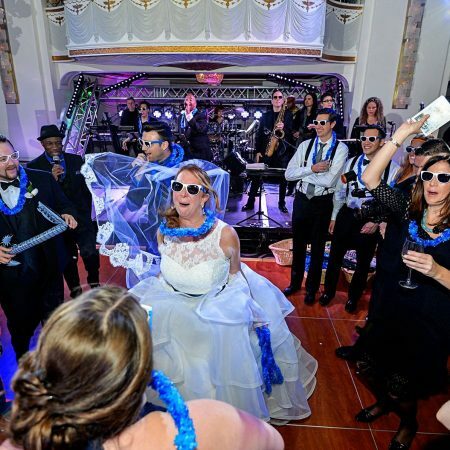 If you have most of your wedding already planned, try to bring in photos of your venue, spaces that needed to be decorated, images of your gown, the bridesmaid’s gowns, and the groom and groomsmen attire. Another great and useful tool to have and review with your designer would be your Pinterest board, you can see ours here! Your wedding day is supposed to be the happiest day of your life, make your journey to the alter a fun, smooth and exciting one! Since we are right in the middle of winter and some may be having a case of the winter blues, we thought it be best to focus on Cherry Blossoms to get into a warmer spirit! The cherry blossom is the national flower for Japan and when adding it to the floral design of a wedding it can create a fresh and romantic atmosphere. 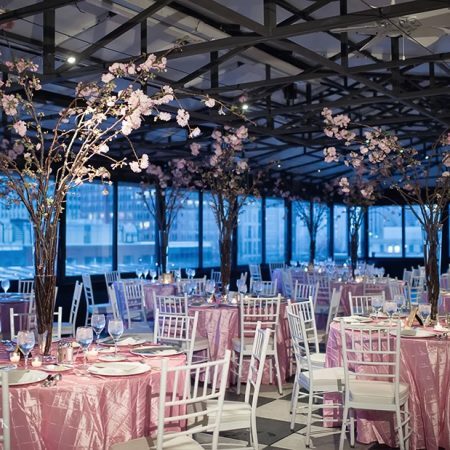 Cherry blossoms are a perfect fit for grand and tall centerpieces, or structural pieces such as ceremony arches. 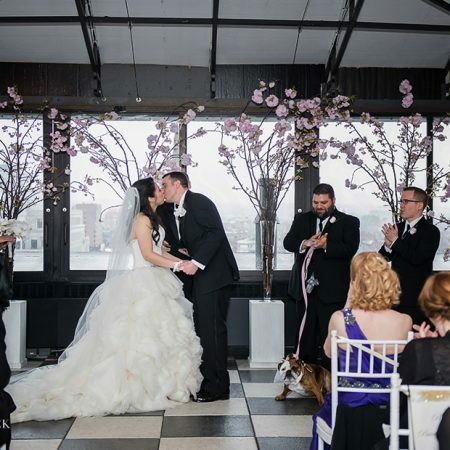 A beautiful wedding at the Taj Rooftop in Boston that Flou(-e)r was a part of had a cherry blossom theme. 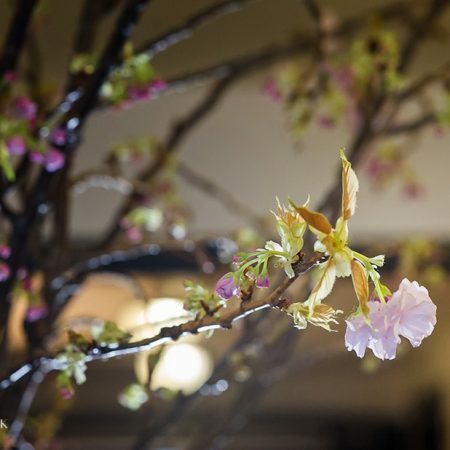 The wedding took place towards the end of March, which is the perfect time to incorporate cherry blossoms into your design because they are available mainly between March and May, sometimes into June. 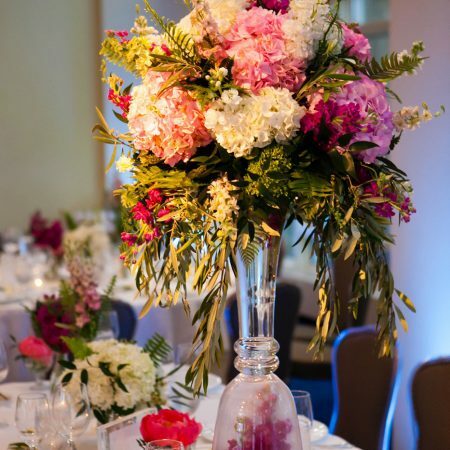 For the centerpieces at the reception, we had tall pink cherry blossoms branches in a 32 inch pilsner vessel. 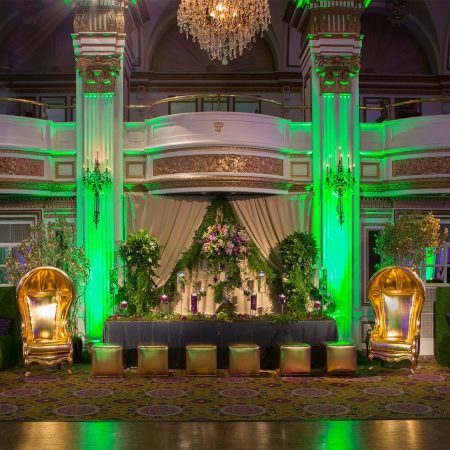 Since the ceremony also took place at The Taj in Boston, the cherry blossom centerpieces were used for a backdrop during ceremony. 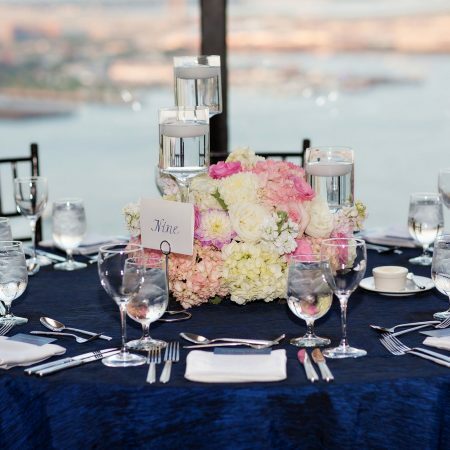 At the place card table, there were cylinder glass vessels at various heights with pink cherry blossom branches in the tallest vessel. 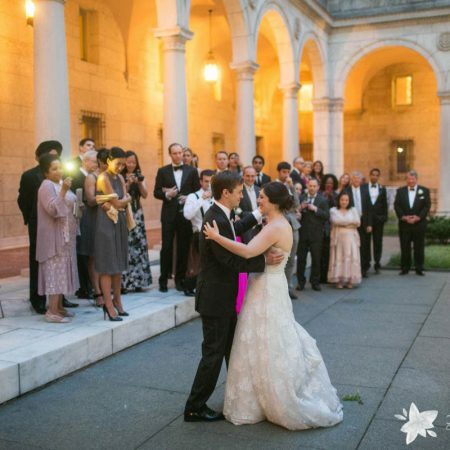 We were honored to be a part of a wonderful wedding and make the couple’s vision become reality! 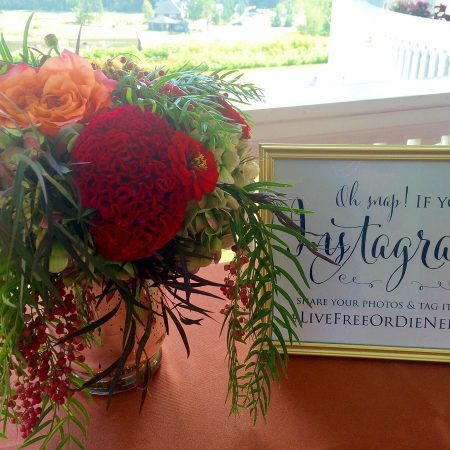 A special thanks for Leah Haydock for capturing beautiful images of the wedding and our work! Come Celebrate with Us This Holiday Season! 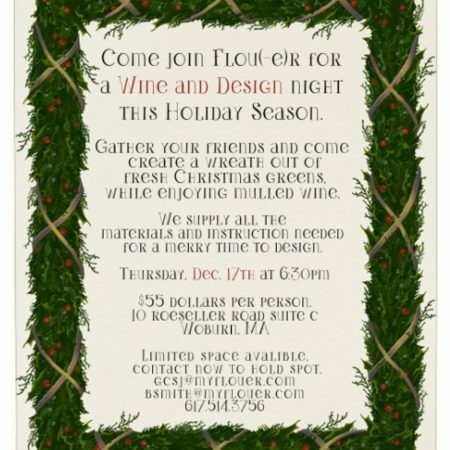 Join us for our Wine & Design Night this holiday season! 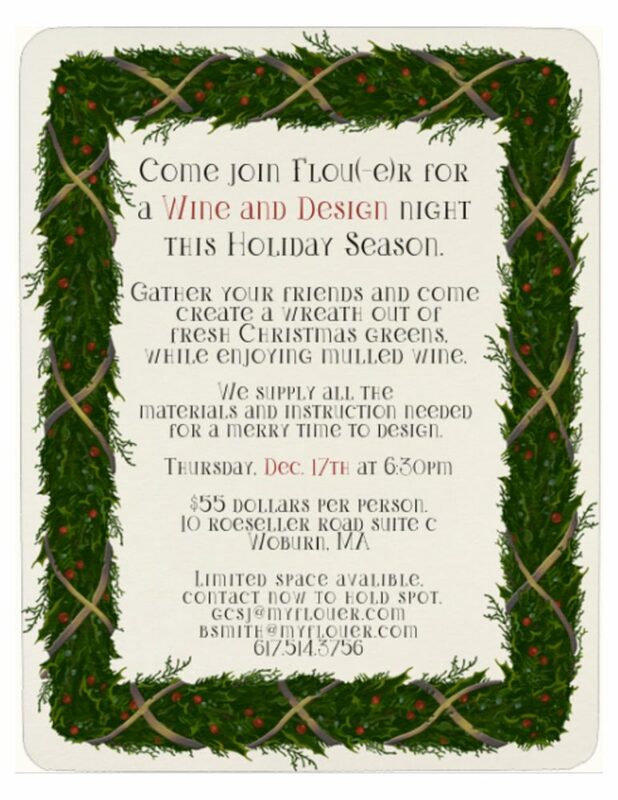 Come celebrate with mulled wine and make wreaths with Flou(-e)r on December 17th, 2015 (Thursday) at 6:30pm. Only limited spots available so contact us at 617-514-3756 for more details or to hold your spot! 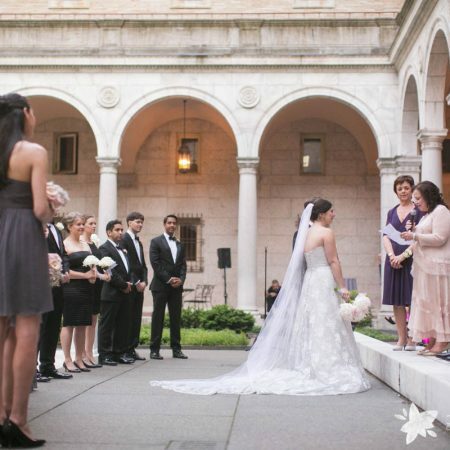 Nothing like ending our wedding season in style with Misty and James’s Wedding at The Boston Park Plaza, which is rich in history and is known for its sophisticated, elegant venue! 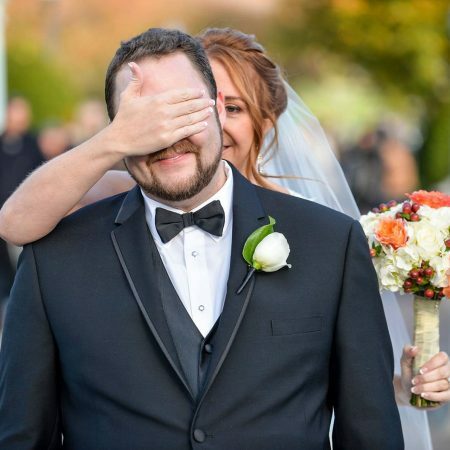 Our bride was more than excited when we handed her the bridal bouquet we designed for her and showed her bridesmaids bouquet, which reduced her to tears. 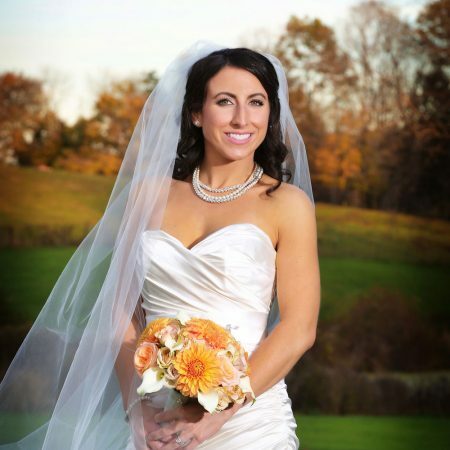 The bridal bouquet consisted of white hydrangeas, white roses, Freespirt orange & red variegated roses, & burgundy hypericum berries that was tied with an ivory ribbon to coordinate with her wedding dress. It had texture and depth through multiple blooms and colorways with an autumnal feel. 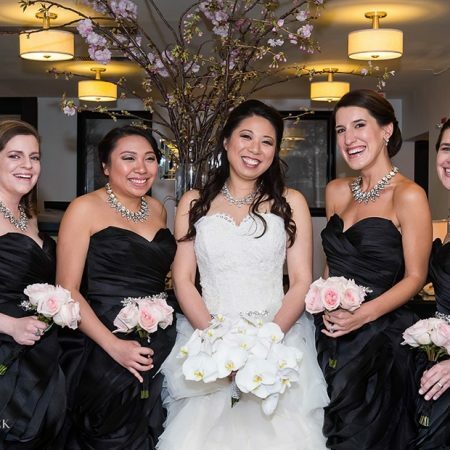 Her maid of honor and bridesmaids also had handtied bouquets which were designed with white roses, mango calla lilies, burgundy hypericum berry’s, orange & burgundy cockscumb, Freespirt Roses, & deep saturated red roses. 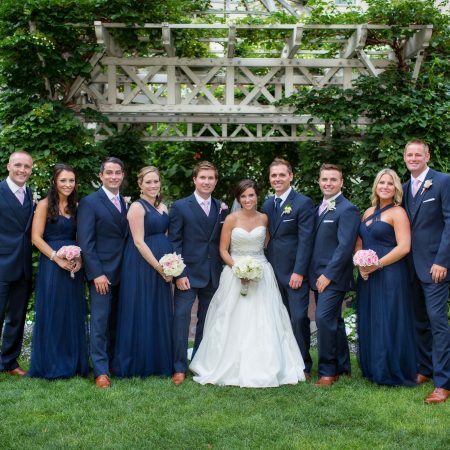 The color scheme of their bouquets complimented their royal blue dresses gracefully. 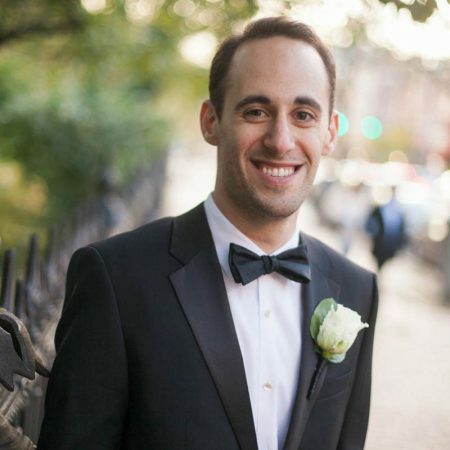 In addition, the groom looked stunning in our boutonniere of a white rose with accents of green all tied together with a black satin ribbon. 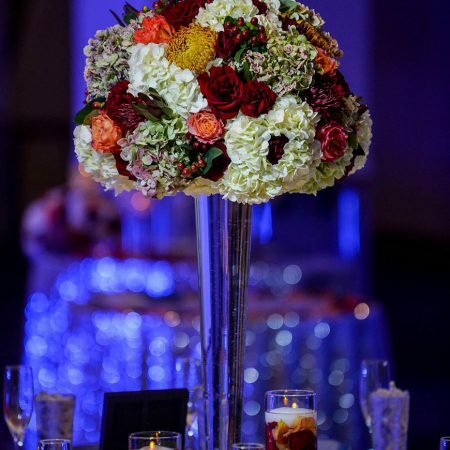 The blooms in the centerpieces were arranged with white hydrangeas, autumnal variegated red & green hydrangeas, burgundy hypericum, deep red & Freespirt roses, burgundy carnations, red & burnt orange chrysanthemums & leucodendron all placed in high clear glass pilsner vessels. 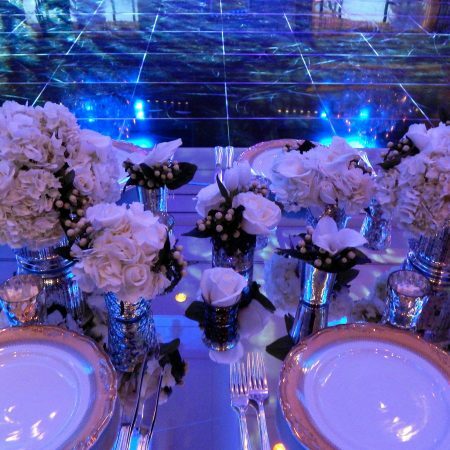 The white hydrangea was at the base of the arrangement with all the other blooms being the show stopper. 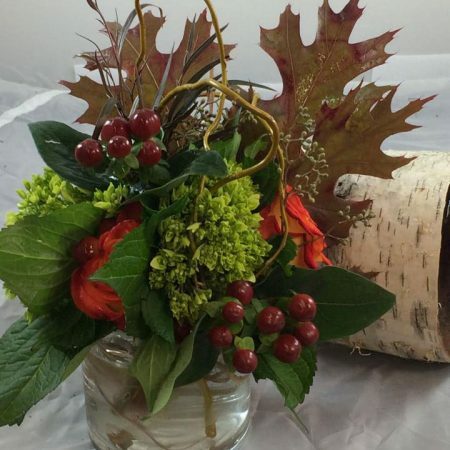 The arrangement had a true autumnal feel to it to tie in the theme of their fall wedding beautifully. 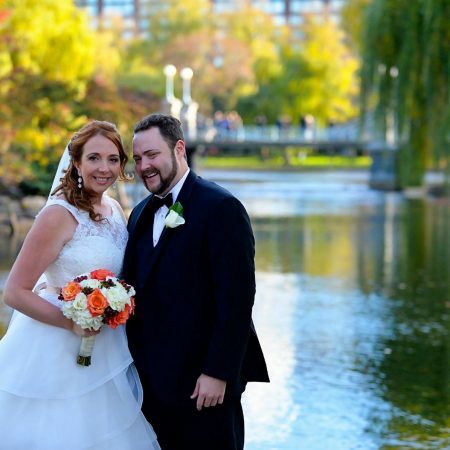 We were honored to be a part of their remarkable day and celebrate the joys of their love! 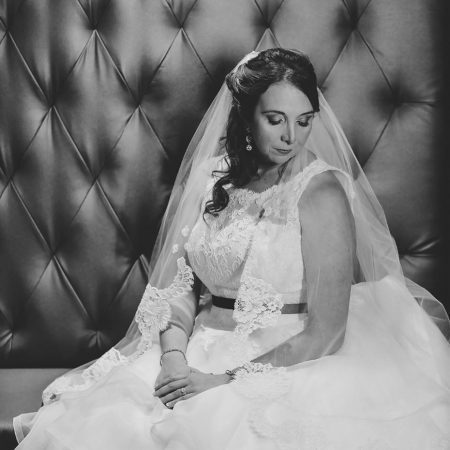 Thank you John LoConte for capturing their wedding day, check out the lovely images he took below! 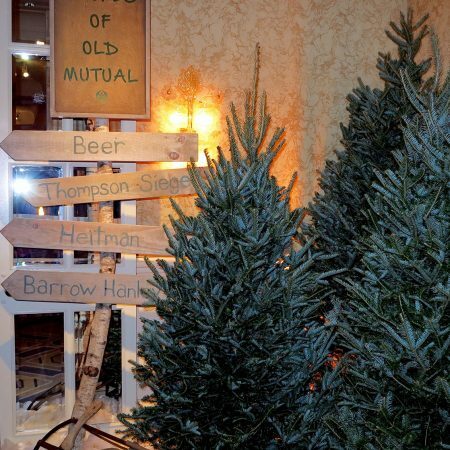 As the holiday season is quickly approaching, so are corporate holiday parties! 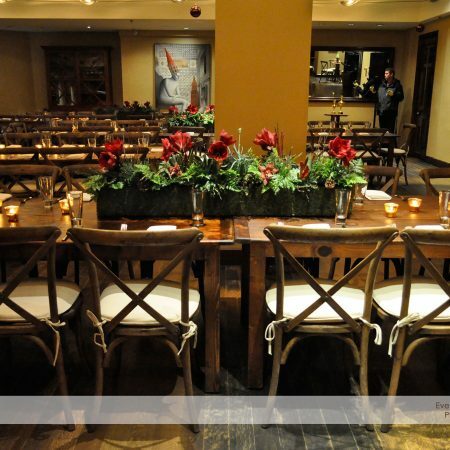 Your concept for the holiday party planning are in the works, but with your busy schedule it will be impossible to accomplish it all so call Flou(-e)r and leave the designing to us! 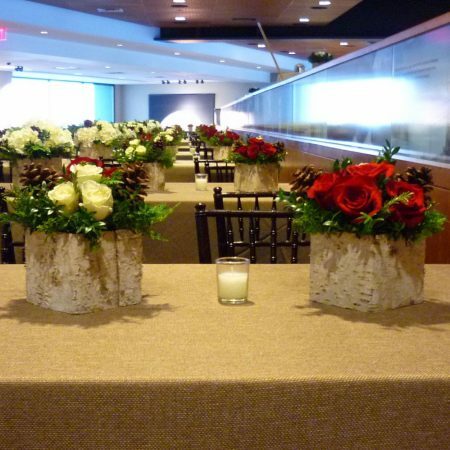 When searching to find the right space to host your event whether it be a ballroom, restaurant or unique venue you should consider bringing along your designer so that they can help offer suggestions on how to enhance the space with holiday florals and decor along with offering suggestions on how to transform the space to look like a holiday party. 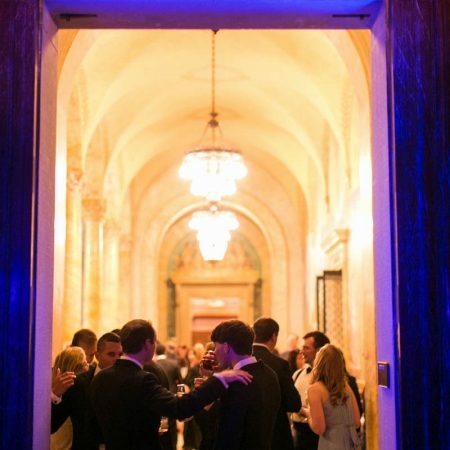 Here are some tips to include when creating a corporate holiday party! 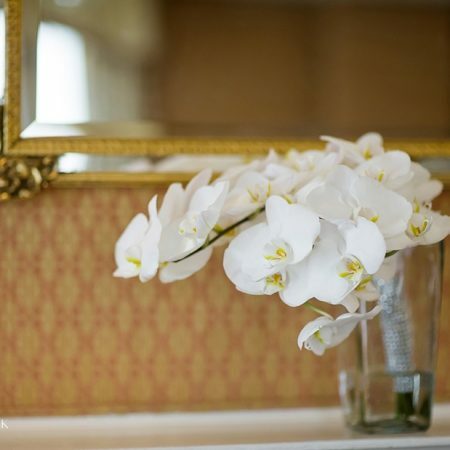 Seasonal blooms will always make any party more chic, elegant, and fit the theme of the party. Try to choose the right hues that will coordinate well with your palette and using subtle but elegant flowers will elevate your ambiance. Find colors that will work well with the background and compliment your setting. Designing your arrangements in elegant ornate vessels or if you prefer more simplistic look, try a small pot or clear cylinder vases. It’s a holiday party so make sure you have lots of food and drink for the guests! Make sure your corporate event provide some delicious crowd favorites or themed colored sweets to match your holiday party. Don’t forget the drinks! Instead of serving it to your co-workers and bosses by hand, come up with a creative way to display the drinks by having a make-it-your-own drink bar or displaying the pre-poured drinks in an artistic manner or better yet hire a caterer to take the stress away from the guests who should be enjoying themselves. Make sure your tables are unique and that they stand out. 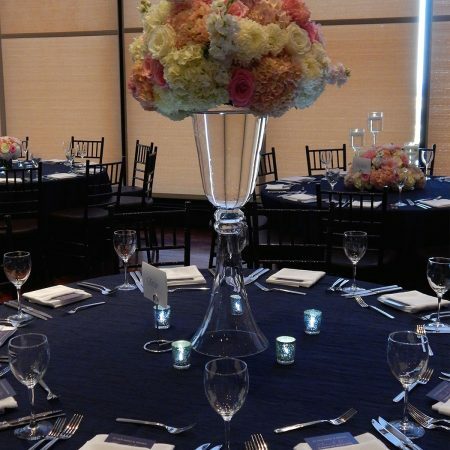 If you are looking for a specific color scheme or a certain personal touch, try adding floral centerpieces that will amaze your guests. For more of an energetic vibe choose linens that are a vibrant, bright, or printed. If you are looking for a cleaner and simply look, go for lighter color tones with a touch of shine. Get sophisticated glassware to compliment your linens. 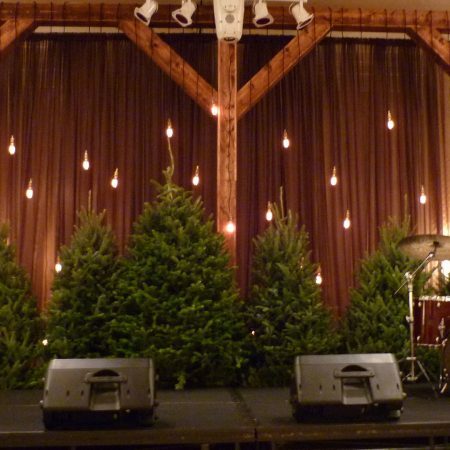 Whether it be a backdrop of twinkle lights or evergreen trees behind your band or DJ or bringing in up-lighting or a chandelier to set the mood, think of transforming the entire space. 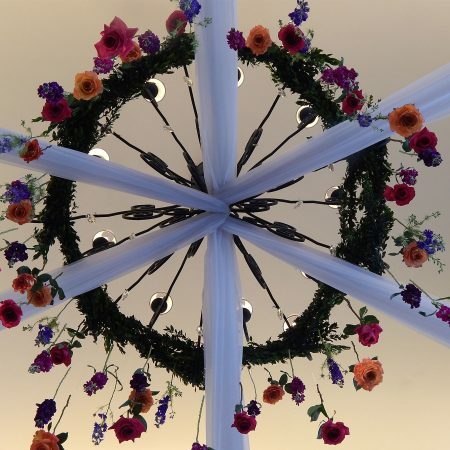 Another way to enhance your space is suspend blooms from the ceiling bringing the entire venue together. 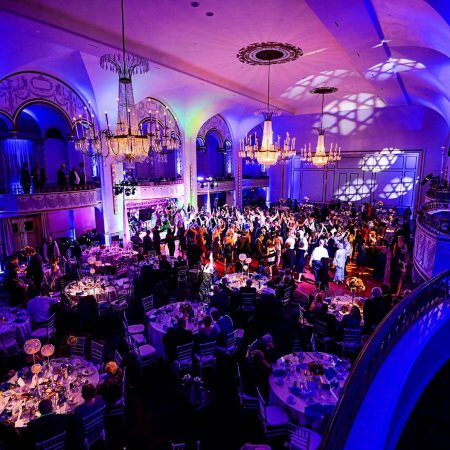 Contact Flou(-e)r to learn more about our services and let us help you coordinate an amazing corporate holiday event this coming season! Call us at 617-514-3756 or use our contact form and we will contact you right back. 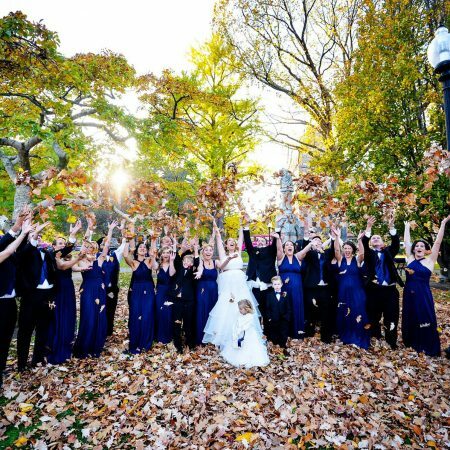 Unlike summer and spring wedding blooms, fall weddings bring on a whole new scheme of color and texture to make your wedding that much more intriguing. 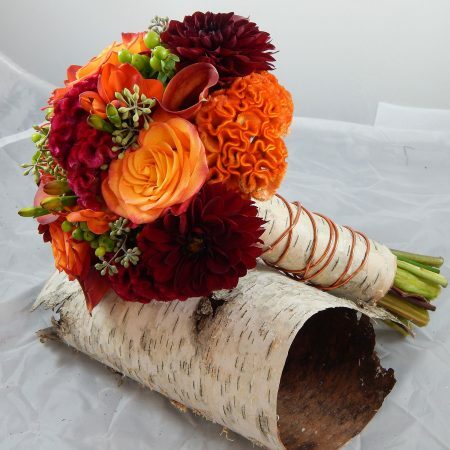 Here are a few fall wedding flower trends that will help guide you to a stylish fall wedding! 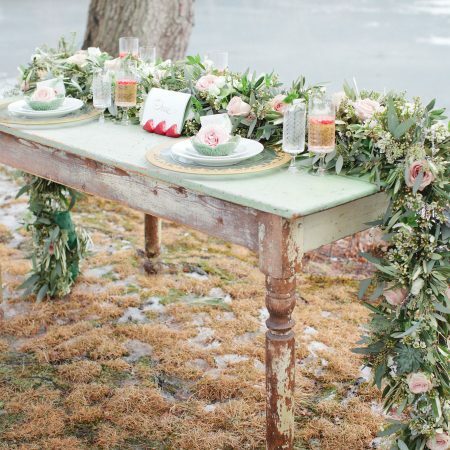 Texture– Adding textured flowers and elements is a great addition to your wedding! 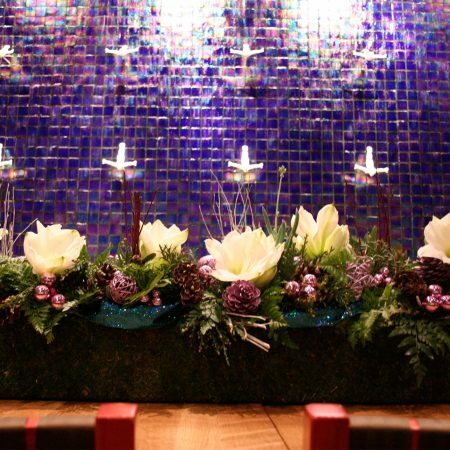 Lush, richly deep hued arrangements is one of the hottest fall wedding trends. For your centerpiece, in place of two or three different blooms opt for a wide range of flowers coordinated with your color scheme. 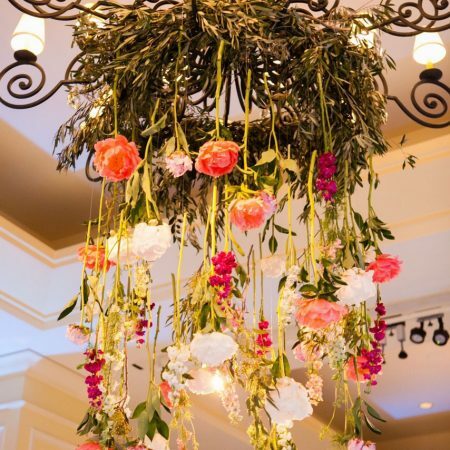 An example of this could be a base of classical flowers such as hydrangeas and roses and add beautiful coxcomb, hanging amaranthus, and kale into your arrangement. Try adding non floral accents such as hypericum berries, lotus pods, fiddlehead ferns, or even dusty miller to make your arrangements more chic and fall wedding ready! 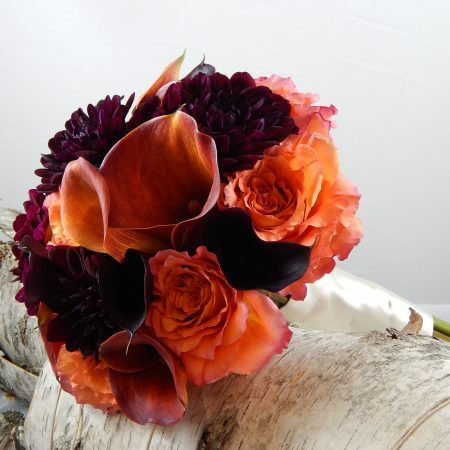 Rich Hues- Classical flowers in rich hues are the epitome of fall wedding flowers. Texture might be key, but classical flowers like elegant dahlias and roses in deep, dramatic shades that are in autumn hues are very popular in fall weddings. 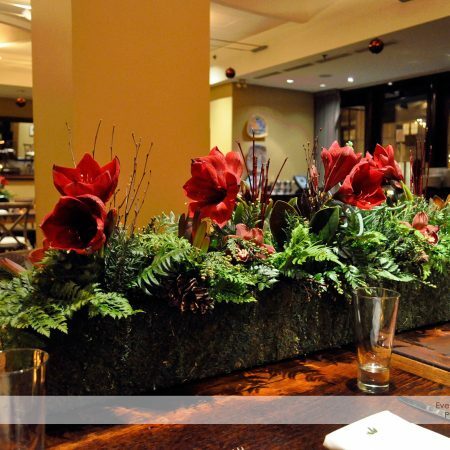 For more of an adventurous arrangement try unexpected colors like copper, forest green, or aubergine in your blooms. Other fall flowers that can go great with your fall wedding theme are antique hydrangeas in a green or purple tone and calla lilies in deep crimson. 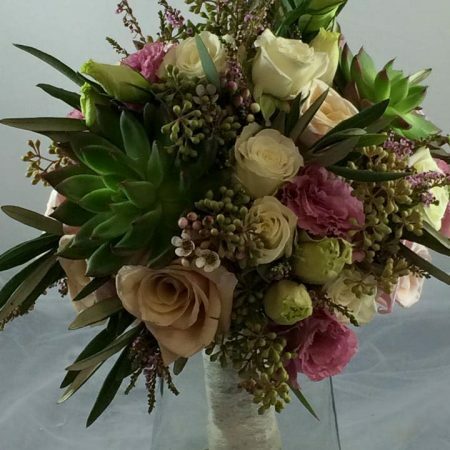 Polished Wedding Bouquet– Autumn wedding bouquets can be more structured and refined unlike summer or spring weddings where the bouquets are more loosely tied. 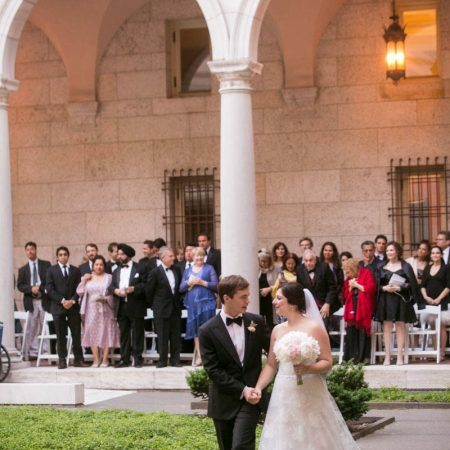 The bouquets can be in the color schemes of red, plum, and green in a round like shape that’s densely packed. Stems should be cut short and instead of having them exposed, wrap the stems in textured fabrics, ribbons, or velvet sashes. 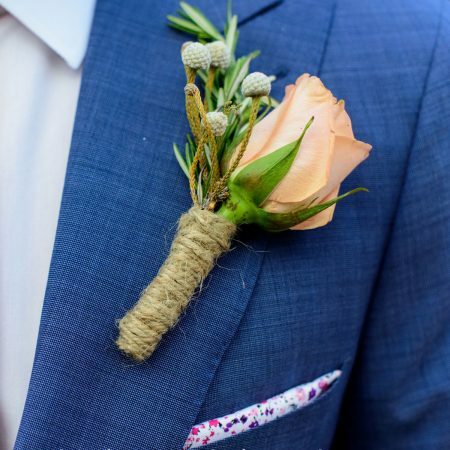 As for boutonnieres, they can be polished with a satin ribbon or burlap around the stems. Plants- A popular landscaping trend for centerpieces at fall weddings are succulents. They add a great accent with their deep fall colors like aubergine, cactus green, and pomegranate. Succulents also mix well with flowers since they have leaves that look like petals. 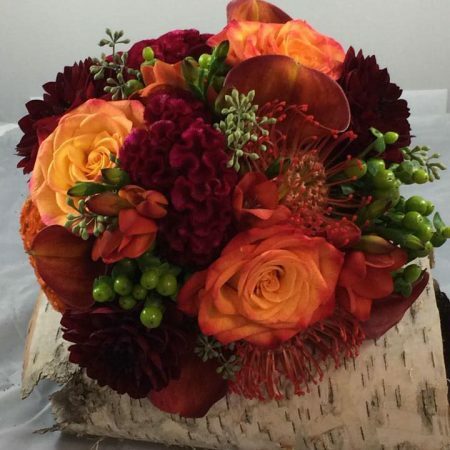 For a tasteful Autumn wedding with rich hues of fall blooms that have great texture call Flou(-e)r at 617-514-3756 today to set up an appointment with us! 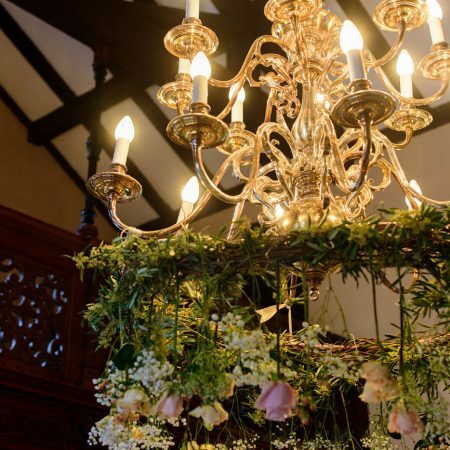 We can help you arrange the perfect blooms for your Autumn themed wedding. 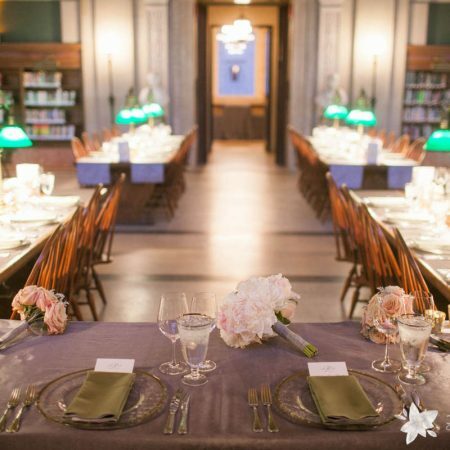 When looking at your venues blank reception space try to imagine the possibilities to transform your space, not only low and high centerpieces but how to accentuate the existing fixtures within the space to wow your guest. What about the window sills, the chandeliers, or even niches within the space. 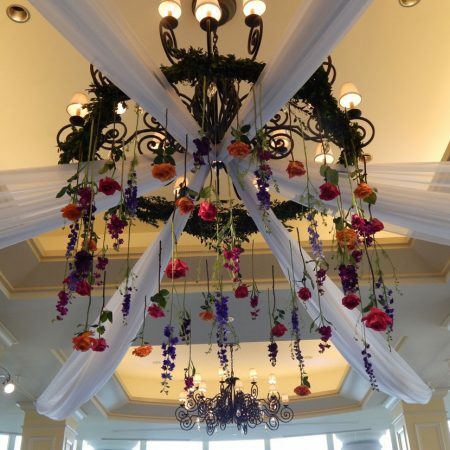 Suspended wedding décor has been a huge trend this year! 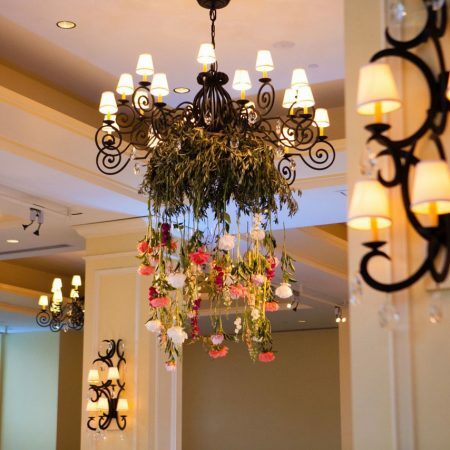 Floral chandeliers especially has looked romantic and stunning at weddings. 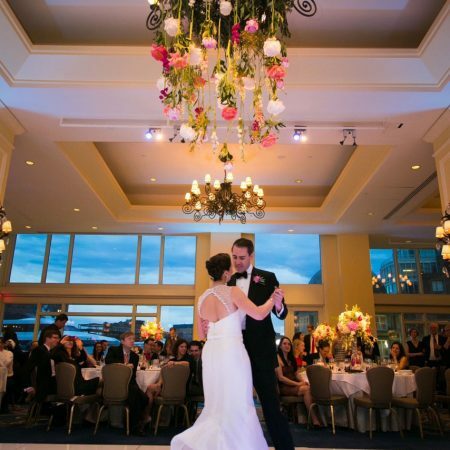 Chandeliers in and of itself gives even the most raw of spaces an upscale vibe, it creates texture and amazing accents for your wedding. 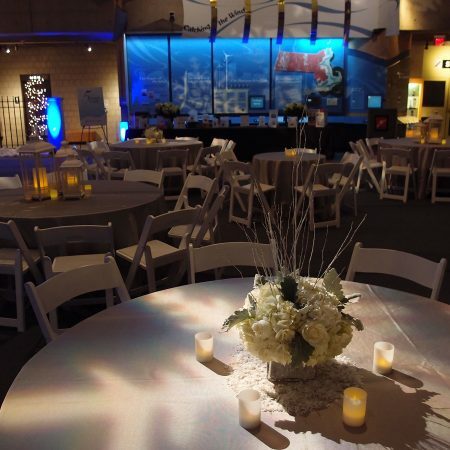 Have your vendors work together to create even more depth, texture and interest by up lighting, pin spotting, or suspended sheers to create even more of a dramatic effect. 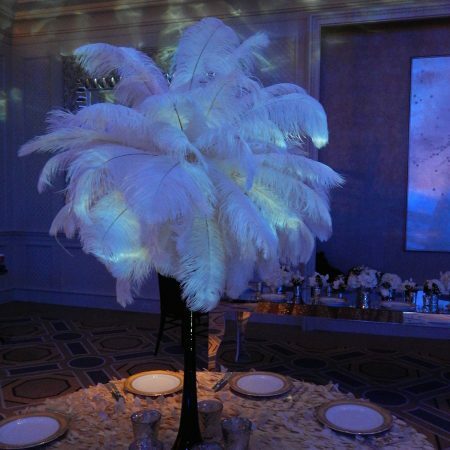 Here are some examples below of some of the magical creations we did for past clients! 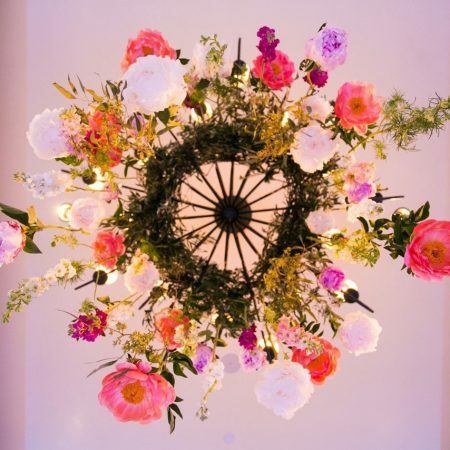 Call Flou(-e)r today to set up an appointment to create your own floral chandelier today! Celosia, otherwise known as cockscomb, is a unique bloom that is in season throughout summer to late November. There are two common types of celosia, the Bombay celosia look like a velvet brain or a piece of coral and the crested celosia which has feathery plumes resembles fluffy grass. 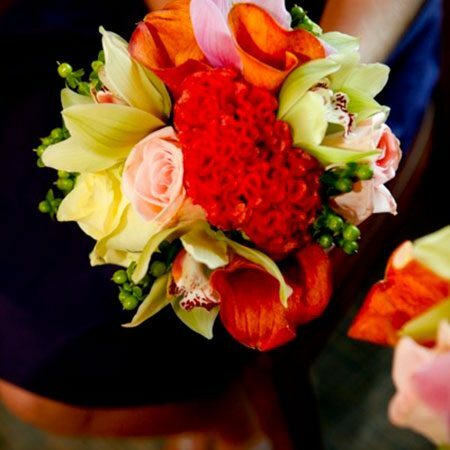 These blooms come in many hues such as orange, pink, hot pink, red, yellow, and chartreuse making it much easy to compliment your wedding theme. Cockscombs are great for summer weddings since it holds up in the heat well, but also great for the fall because of its deep saturated color and looks chic throughout your special day. 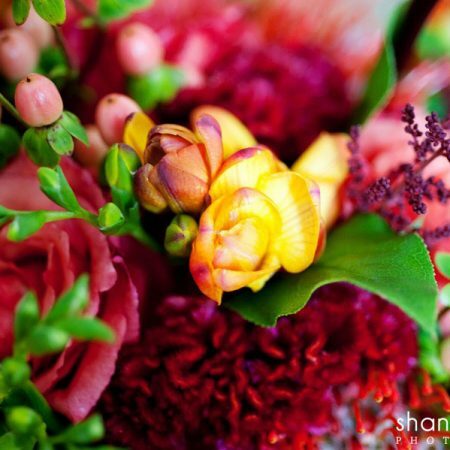 Even though these blooms have a funky look, celosia looks amazing with traditional flowers such as orchids or roses. 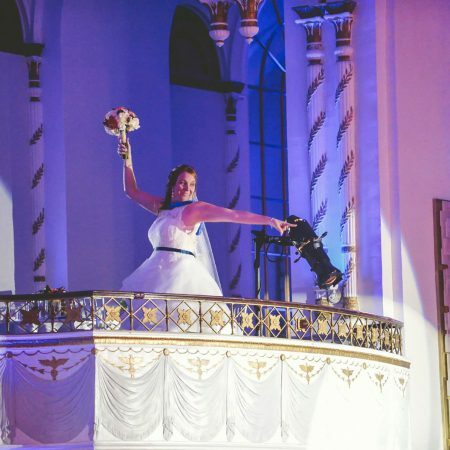 Even just a whole bouquet of cockscomb will be a showstopper anywhere you place them! Celosia not only looks velvety, it feels just as it looks and people can’t resist touching them. 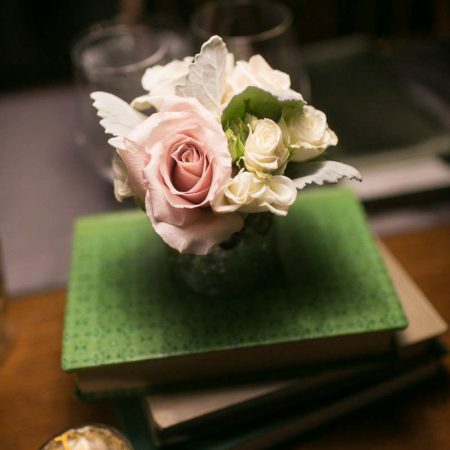 They give a unique texture and accent to other blooms and is a great conversation topic at your wedding reception. 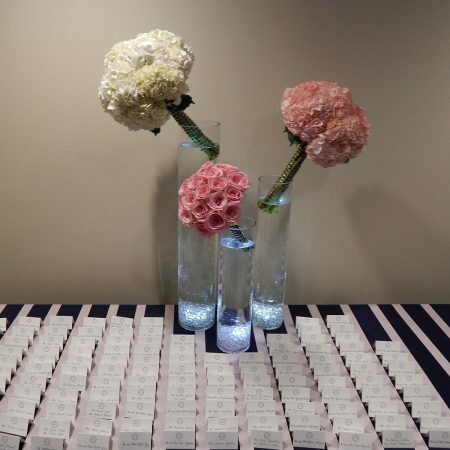 For your upcoming fall wedding, call Flou(-e)r today at 617-514-3756 to learn more about celosia or fill out our request form here to book an consultation with us! 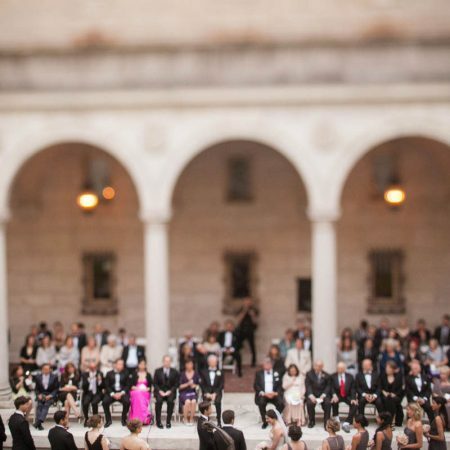 It’s summer and a perfect time for a wedding! 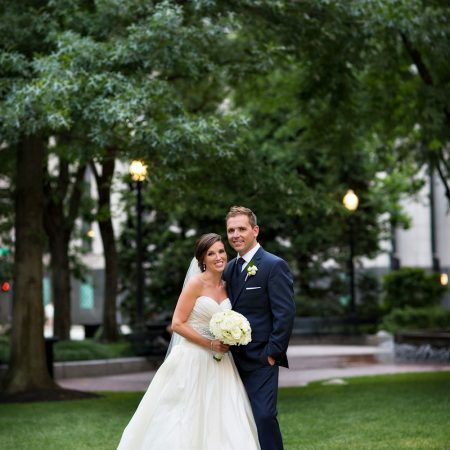 Katelyn and Kevin celebrated theirs last July at The State Room in downtown Boston. 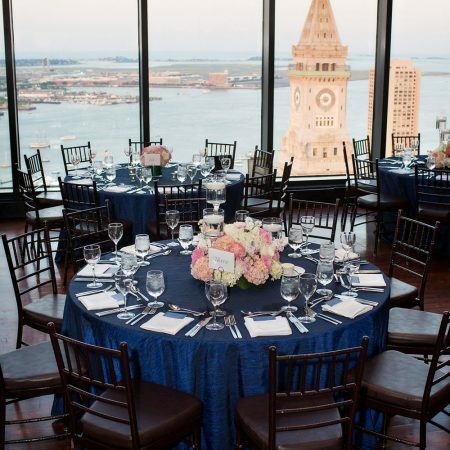 This venue is known for their stunning and unparalleled views that overlook the city and the Boston harbor. 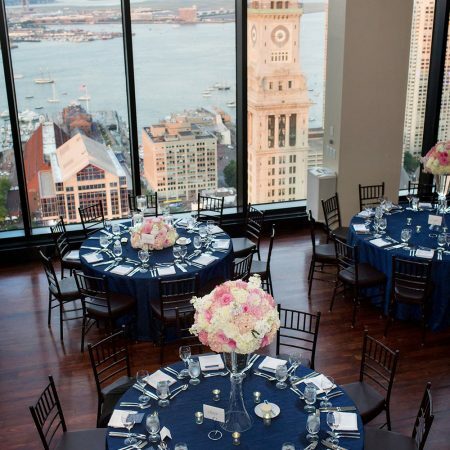 The tables were adorned with navy blue satin linens that paired nicely with the urban chic venue. 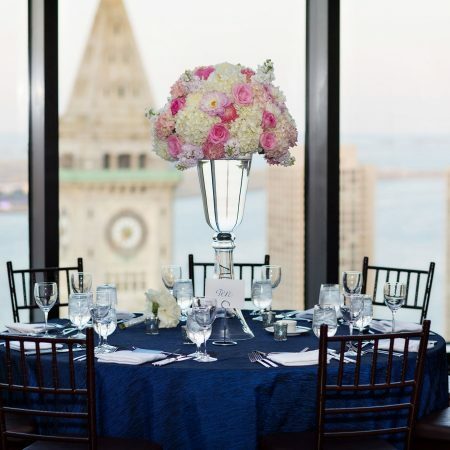 Their soft pink centerpieces complimented the elegance and the color scheme of the room. 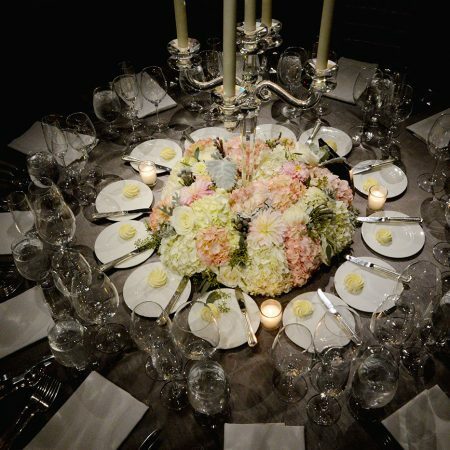 The ornate clear glass vessel set the stage for a grand arrangement on top consisting of white & blush hydrangeas, dahlias, many shades of pale pink roses, stock, along with football mums. The hydrangeas created the base of the arrangement and the additional blooms added depth & texture. The arrangements were tall and grand, yet had a traditional feel. 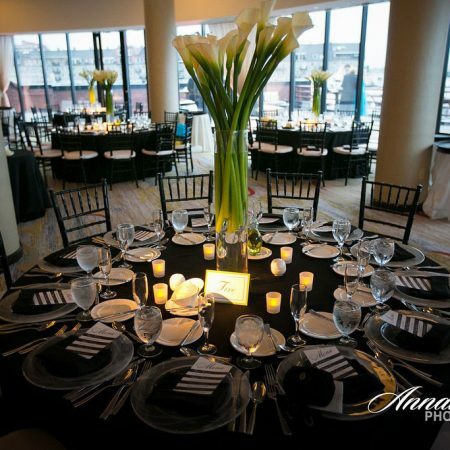 To create visual interest while the guests enjoyed their meals Katelyn and Kevin choose to use clear glass floating candle pedestals with a lush arrangement at the base. 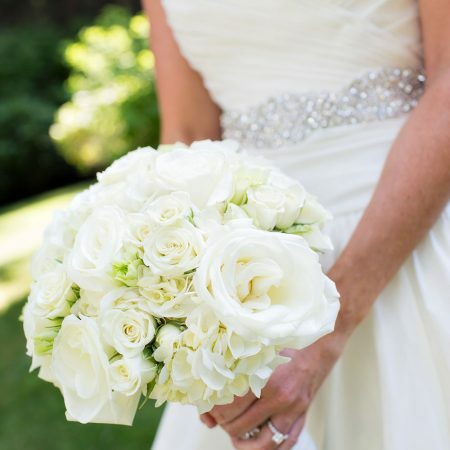 The bridal bouquet was also traditionally reserved, but simply elegant with all white blooms consisting of hydrangeas, tibet roses, spray roses and lisianthus. The hand tied bouquet was wrapped with ivory satin ribbon with some stems to show. 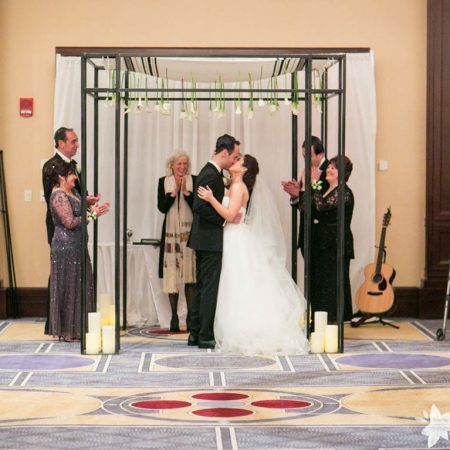 We had an amazing time creating this elegant wedding while seeing their vision come to life! Thanks to Person & Killian for capturing such amazing images for us. 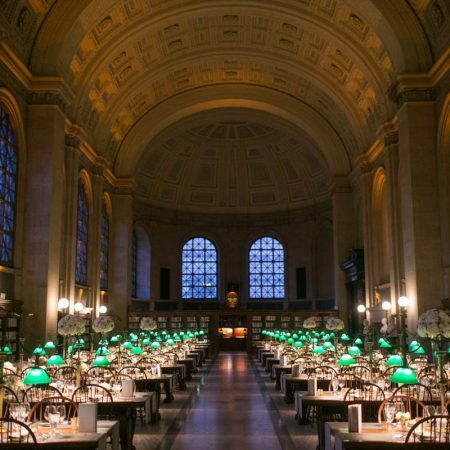 Established in 1848, Boston Public Library was the first large municipal library in the United States. 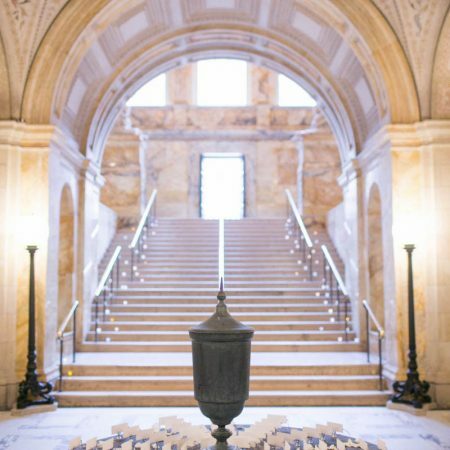 Boston Public Library offers one of the most historic and unique event venues in the city. 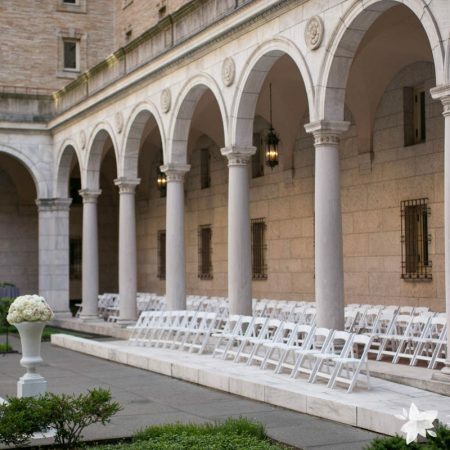 They accommodate a variety of captivating spaces that offers an ideal setting for special events like weddings. 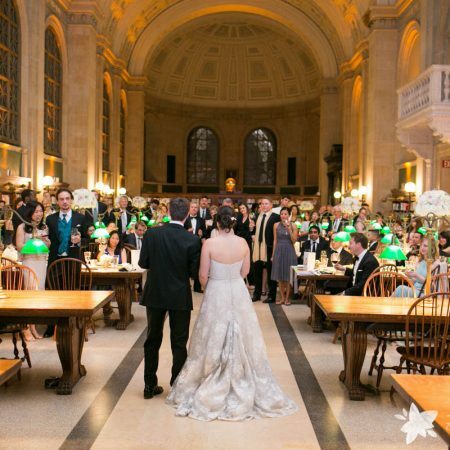 We were able to experience the magic that Boston Public Library had to offer through Ashley and Marco’s wedding! 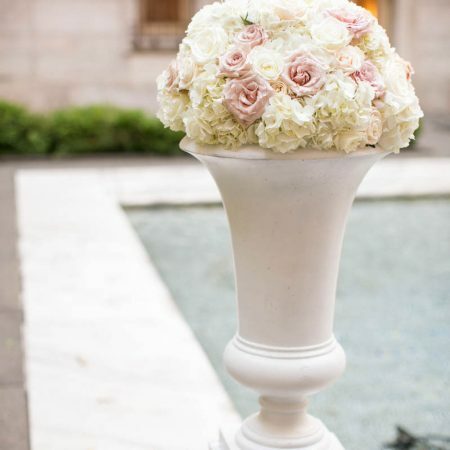 The bride had an arrangement of white and light blush peonies for her bouquet which had depth and texture through the use of multiple lush blooms with a white and blush colorway. 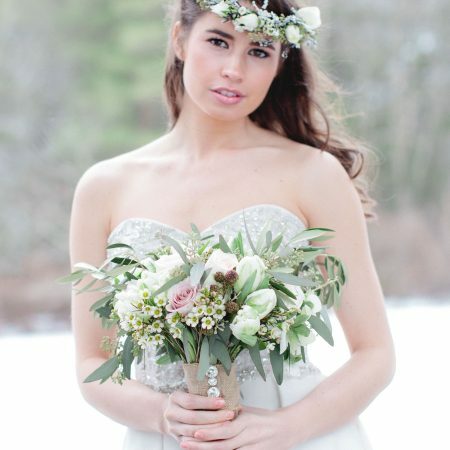 She had white freesia and cream spray roses that were placed in her hair that looked stunning with her wedding dress. The groom’s boutonniere had an elegant touch of a single white ranunculus with a rosemary accent that was wrapped in a black satin ribbon. 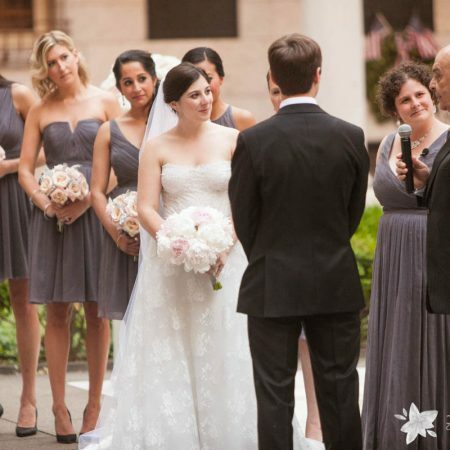 The bridesmaids all held blush roses with infusions of silver-green dusty miller that were wrapped with a silver ribbon to flatter their darker grey dresses. 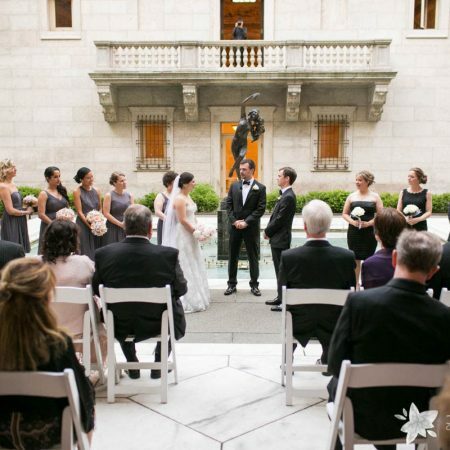 The ceremony for these two love birds where held in one of Boston Public Library‘s beautiful outdoor courtyard with its gorgeous bacchante and infant faun fountain in the middle of it. 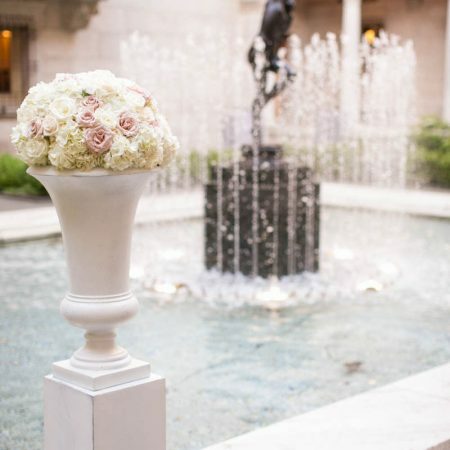 The space that was in front of the fountain, which was the backdrop for where the vows had taken place, was complimented with traditional white urns that were filled with white hydrangeas, white, cream & champagne roses on each corners of the cascading water fountain. 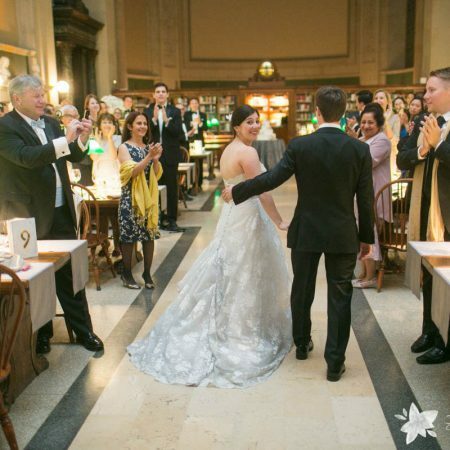 After exchanging their vows, the bride and groom had their first dance. 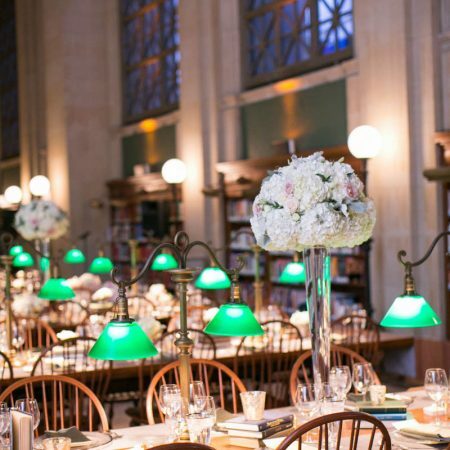 Inside the library, the reception was held in Bates Hall where the rectangular tables were lined with centerpieces that were ornate mercury glass vessels in different sizes that held arrangements of white hydrangeas, white, cream & champagne roses, white cream spray roses, white lisantuis, olive greens, seeded eucalyptus & dusty miller. 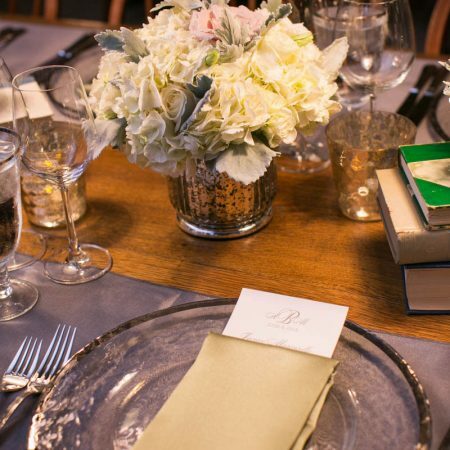 The tablescape had depth and texture through the use of multiple vessels, with natural, lush blooms and greens. 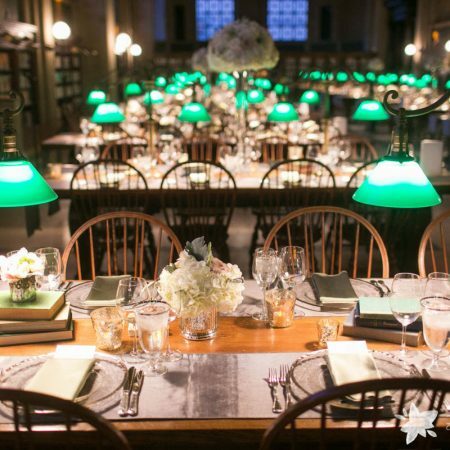 It looked amazing with the books from the library that the bride handpicked and placed throughout the tables. 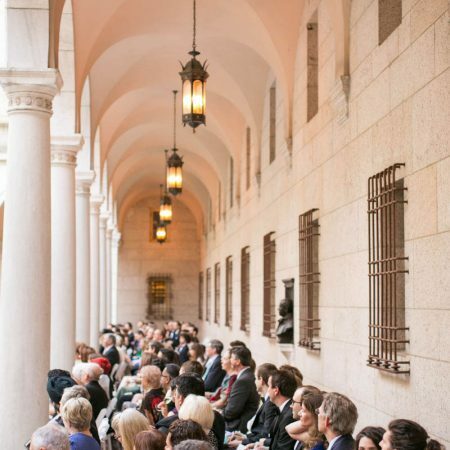 Congratulations again to Ashley & Marco, it was an exquisite vision to be a part of especially in the heart of Boston! 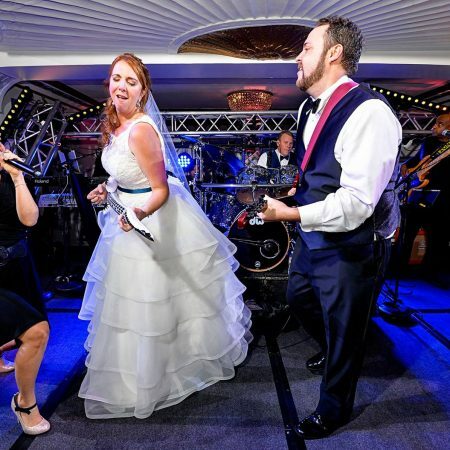 Take a look at their pictures of their special day, credits are given to Zev Fisher for the wonderful images below! Dahlias, which were named after the 18th century botanist Anders Dahl, are in season right now and are a beautiful addition to add to your wedding this summer! Dahlias have more than thirty species within its family so they come in many different sizes, shapes, and hues of color. These flowers can be as tiny as dainty pom-poms to as large as “dinner plates” because they can bloom to the size of an actual dinner plate or even have shaggy spider heads! 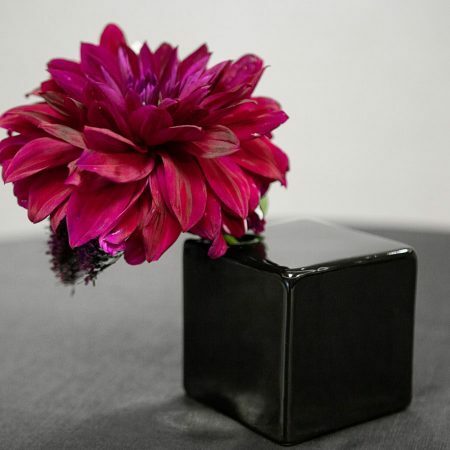 Dahlias are only available in the late-summer or early fall, so they are perfect for weddings during this season and they are more affordable than peonies. 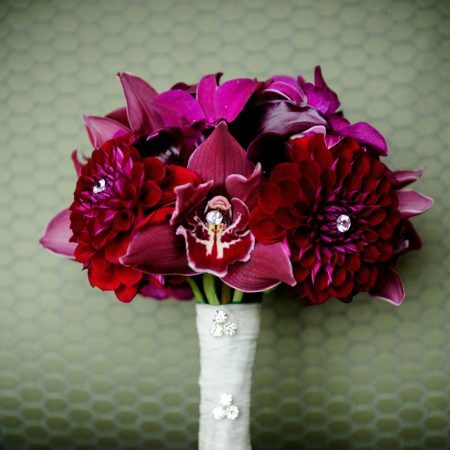 Most recognized for its array of shades and stunning petal arrangement, Dahlias are ideal for a budget-conscious bride. Dahlias are perfect for modern weddings due to their symmetrical petals which looks graphic and remarkable on their own or with other blooms. 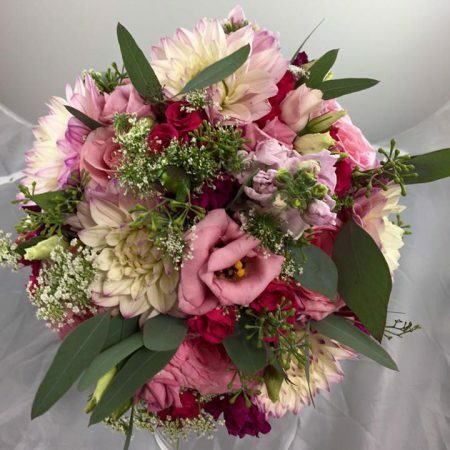 While dahlias are exuberant flowers to gaze upon, they additionally offer a great deal of meaning which makes it ideal to use on your special day. They symbolize elegance and dignity but also thought to express an eternal bond between two people, wishing couples a commitment and bond that lasts forever. Dahlias are perfect for your wedding because they can match into any decor you are looking to create whether it be for your bouquet or mixed with other blooms in a centerpiece. Since they take on many different personalities depending on the type and colors of the flowers you choose, in the end, there is no way of going wrong! 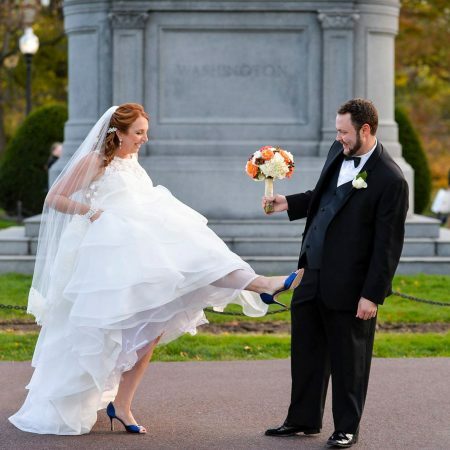 Call us today at 617.514.3756 to get Dahlias exquisitely arranged for your wedding this summer!